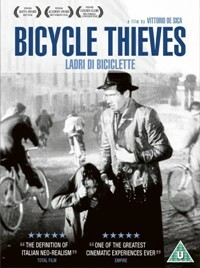 Bicycle Thieves is widely regarded as the most quintessential of Italian neorealism films and a timeless classic. It received an Academy Honorary Award in 1950 and, just four years after its release, was deemed the greatest film of all time by Sight & Sound magazine's poll of filmmakers and critics. Fifty years later the same poll ranked it sixth among greatest-ever films. "Antonio (Lamberto Maggiorani) is a poor man who is thrilled when he is at last offered a job: delivering and putting up movie posters. But he needs a bicycle, and must supply his own, so his wife Maria (Lianella Carelli) pawns the family's entire stock of bed linen to redeem the bicycle he had already hocked. On his first day at work, the unlocked machine is stolen and Antonio drops everything to go on a desperate odyssey through the streets of Rome with his little boy Bruno (Enzo Staiola) to get his bike back, pleading and accusing and uncovering scenes of poverty similar to theirs wherever they go. "This landmark Italian neorealist drama became one of the best-known and most widely acclaimed European movies, including a special Academy Award as "most outstanding foreign film" seven years before that Oscar category existed. Written primarily by neorealist pioneer Cesare Zavattini and directed by Vittorio DeSica, also one of the movement's main forces, the movie featured all the hallmarks of the neorealist style: a simple story about the lives of ordinary people, outdoor shooting and lighting, non-actors mixed together with actors, and a focus on social problems in the aftermath of World War II.